There is something kind of neat about Czech and Czech culture that hit close to home today. I don’t claim to understand exactly how this works, but When a girl is born in Czech her last name is given the letters “ová.” For example, check out this list of Czech female tennis players on Wikipedia. The overwhelming majority of them have the added “ová” to their last names. As I understand it, at their birth or when they’re married, if their last name was say “Smith” then it would be come “Smithová.” So what does this have to do with us? 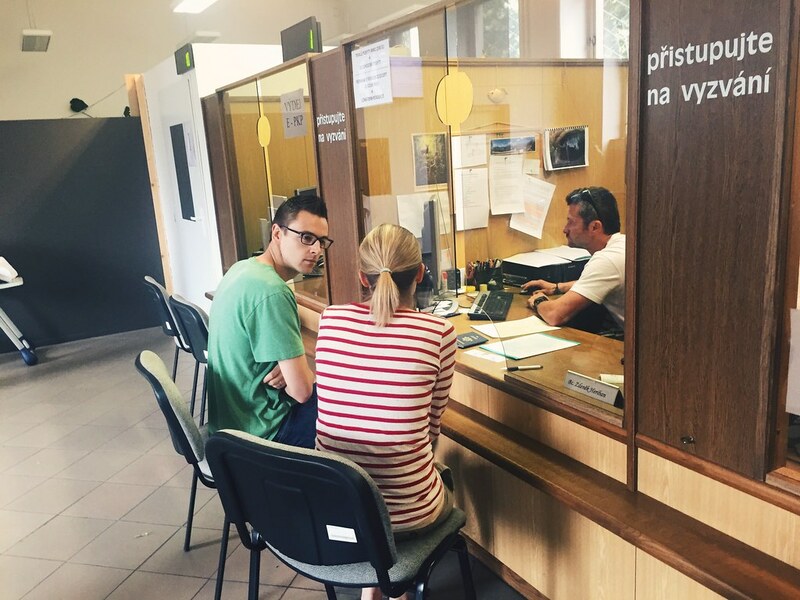 Today we went to the city hall in Ostrava to obtain Karis’ Czech birth certificate, or “Rodný List.” We need it in order to move forward with getting her a passport and social security number. Although she’s an American citizen by birth (because of Bethany and I), we have to go through the normal process of obtaining these documents so we can travel with her (among other things). Culturally in Czech, moms don’t usually take their babies away from home until six weeks after their born, so it’s often the dad who will go to obtain the birth certificate and the mom is not required to be there (of course, because she’s at home recovering). So today I, along with our friend Jenny and my father-in-law went to do just that. Jenny was kind enough to come and help translate and I’m so thankful she did. Basically what happened today was that I had to decline the Czech naming convention so Karis’ last name wouldn’t be “Thomasonová” but just Thomason. Normally this requires the mother’s signature, but Bethany wasn’t with us. The Lord was gracious, however, and somehow we got it figured out today without having to drive back another forty minutes and get Bethany. The lady at the city hall was really kind and through Jenny translating we were able to get it squared away. We were only there for a few minutes and we left with a complete birth certificate and Karis can carry our family name in the traditional, American way. Step 1, done. Step 2 involved going to the “Foreign Police” to register Karis (shown above). Because we don’t have a passport yet, we were a little unsuccessful but got the ball rolling which was good. Again, Jenny was a huge help in navigating the language barrier and figuring out what will happen next (THANK YOU, JENNY!). It sounds like the Czech government is going to send us some documents in the mail and give us a 60 day window to make it all happen. Step 2, done. Step 3 involves multiple things, but it involves getting a “Consular Report of Birth Abroad,” applying for passport as well as a social security number. For us this means a trip to the U.S. Embassy in Prague which will happen on June 22 (unless we can get an earlier appointment). We’re going to Prague this week with Papa and Nana for a few days and we’re hoping that an appointment might open up while we’re there. It would just make it easier on us as Prague is over four hours by car or train. We’ll see how it goes! At the end of the day I’m thankful we were able to get what we needed to take the next steps in this big process of having a child abroad. Even tomorrow we’re hoping to get her passport photos done right here in our town. Pray for us!